In the last tutorial we install Oracle VM VirtualBox on Fedora Workstation 23. In This tutorial we are going to learn how to install VirtualBox Extension pack on Fedora Linux. It is very easy to install the virtualbox extension pack on Fedora. Go to following URL www.virtualbox.org/wiki/Downloads and download Oracle VM VirtualBox Extension Pack for All supported platforms. Then double click on the downloaded file to launch the installer with VirtualBox manager. 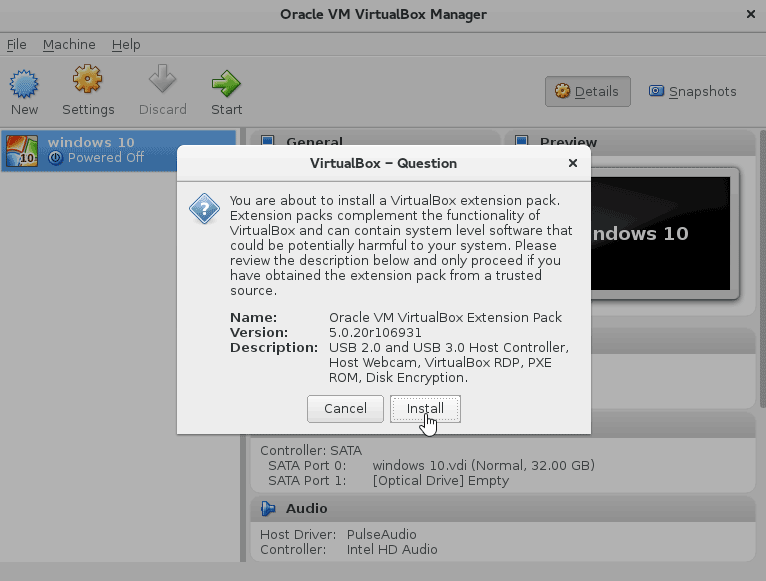 In the Dialog box, click on the install button to install VirtualBox Extension pack on Fedora workstation. VirtualBox extension pack enables some useful features like VirtualBox RDP,USB support and Disk Encryption.